Make use of the best C++ unit testing framework. Besides being very easy to use, the CUTE framework leverages modern C++ libraries and features. To use CUTE as a standalone framework, follow the link to the GitHub repository. The CUTE Eclipse Plug-in is one of the many helpful plug-ins of Cevelop, your number one IDE for safe C++ development. Go have a look at what Cevelop can offer you on the official Cevelop website. CUTE, short for C++ Unit Testing Easier, is an easy to use C++ unit testing framework that leverages modern C++ libraries and features. CUTE is orthogonal, easily extendable and much simpler than other C++ unit testing approaches like CPPUnit. For example, CUTE does not require that you write a derived class for each C++ class you want to unit test. 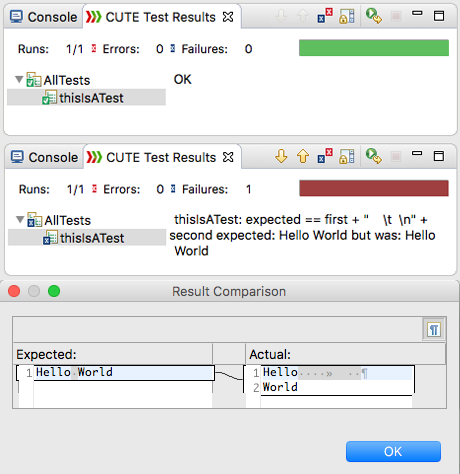 The CUTE Eclipse Plug-in supports easy development and management of CUTE unit tests for your software. Features like red/green-bar result visualization, automatic test registration and code coverage alleviate every-day tasks of a software developer. The plug-in also encourages test driven development through various code generation mechanisms, reducing development time significantly.